Your assistance in completing this form will help us place the right puppy with you. If you feel additional information would be helpful, please include it. All information will be kept confidential and used only by us. Thank you for your cooperation and interest. Why have you decided to purchase a Cavalier? If you have a preference, why? Do you have a “color” preference (Black/Tan, Blenheim, Ruby or Tri)? Who will have primary responsibility for the care and feeding of your new puppy? How long will puppy be alone? How long will puppy be outside? How big is the fenced yard? Where will your Cavalier sleep at night? What kind of training i.e. classes or other methods will you utilize? Who will train this dog? Have you ever completed an AKC title of any kind? Circumstances of your last pet’s death and age? Have you ever taken a pet to pound or shelter? Why? What do you feed your current pets? What type of veterinary care do you consider absolutely necessary? What would you do if you found that you could no longer keep this dog? How do you feel about dog hair on your rugs and furniture? What type of personality are you looking for in your puppy? 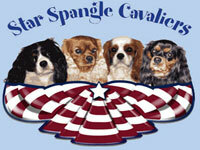 What do you think will be the best part/parts of having a Cavalier in your life? What do you think will be the worst? What do you and/or your families do for fun? How active are you? Are you an avid hiker, swimmer, runner, computer nut, couch potato? If so, how many hours would the puppy/dog be left alone? What are your plans, as to how to raise the puppy, while working? How many vacations a year do you take? What will you do with your dog while you are away? Please feel free to add any comments or questions. Once again, please feel free to add anything you think we should know. This questionnaire must be filled out and returned to us before we can consider putting your name on our waiting list. Thank you again for your time and interest. Please don’t hesitate to call or e-mail. Please contact the Webmaster if there are any problems.